Monthly Storage Rental. We have many different sizes of units, from 4’ x 5’ to 20’ x 20’ Rooms. There are no minimum stays, and all contracts are month-to-month. No Security Deposit, No Credit Check, No Hidden Fees. For qualified customers we do not require a security deposit or credit check to rent a unit. Budget Self Storage does not charge any administrative or other hidden fees for new rentals. Insurance Available. Insurance is offered for your belongings through a 3rd party vendor. Free Move Service. Budget Storage offers a local free move using our official Budget Storage truck to our facility for new customers who prepay for 3 months. You don’t have to rent or borrow a truck when you rent from Budget Self Storage, just call us and we’ll take care the logistics. Expert Advice. With nearly 20 years experience in storage, our Storage Consultants help you choose the right size storage unit, supplies, and assist in moving and logistics so you don't overpay. Packing and Moving Supplies. We offer a complete range of moving and packing supplies to help protect your belongings. Climate Controlled Units. We offer climate-controlled units for proper storage of items sensitive to the elements. Easy Access. Our building features four deck-height loading docks for easy loading and unloading, free flatbed carts3 for moving your belongings, an extra-large industrial-strength elevator and an ADA-compliant handicapped entrance. Our convenient hours of operation makes it easy for you to access your belongings whenever needed. High Security. As a former ice-cream factory, Budget Storage is built like a brick fortress. All access points are covered by constantly monitored closed-circuit cameras, so that no one can enter the building without our security team knowing. 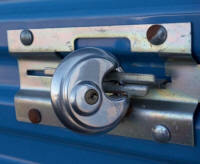 You provide your own locks and keys, so you have exclusive access to your unit contents.